. . . The biggest secret to staying organized is have a dumping area, more commonly referred to as a Storage Room. Here, I’ll show you a picture of mine. It’s not pretty (and they don’t have to be)! It’s just the place where everything goes when we don’t know what to do with it. You might not be able to see it, but my storage room is somewhat organized. It really doesn’t matter to me if things get a little crazy in there. I don’t spend any time in this space, except to run in a grab something once in a while. Also remember that I live with a couple of people who are less interested in staying organized than I am. Note the paint cans on the floor (not on the shelf where they belong). “We” did some painting last week. Having this space allows me (and family) to not deal with every-single-item that we touch the moment it’s in our hands. Sometimes making the decision to let go of something takes some time. And where do we put all that cute stuff that we want to keep as a memory? My wedding dress is somewhere in that photo, which means I kept it, even though I only have sons and the dress has an awful 80’s thing going on. When I first meet with clients and we look at their space, I always inquire about their storage space. My recommendation is that 10% of your home should be allocated to long-term storage. I am not talking closets or garage. Just a room for all those memories, unfinished projects, holiday decoration, camping equipment, etc. Imagine if you had that luxury! It makes it so much easier to maintain an organized home when you have a purgatory of sorts. Now let me just say, having a storage room doesn’t mean that the rest of the house will magically organize itself. It just means that you don’t have to be 100% organized every minute of every day to have an organized home. People who don’t have that option, should look at using space in the attic, garage or spare bedroom for storage. Whatever you do, consider that 10% of your space will hold your past (memorabilia) and your future (unfinished projects). 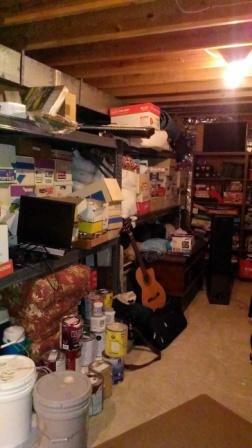 This entry was posted in Residential Organizing and tagged DIY organizing, Organizing Storage Room, Storage Room. Bookmark the permalink.